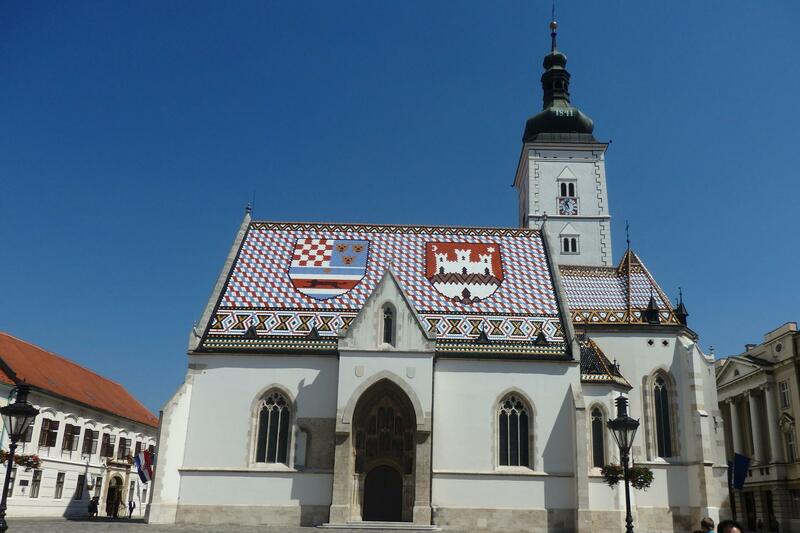 Slovenia & Northern Croatia Escorted Coach Tour. See the capital Zagreb, into Slovenia and then down through Istria and Plitvice Lakes to finish in Split. Departure from Zagreb, easily connect with incoming flights. Includes meals, sightseeing, entrances and transport as per itinerary. Open age Escorted Coach Tour conducted in English (possibly up to 40pax). Double bed or twin bed rooms available. Most triple rooms are a double bed with a single bed. Solo travellers must book a double/twin for solo use with a solo use supplement. A transfer is included upon your arrival from the Zagreb Airport to the hotel. Zagreb offers a welcome jolt of big-city sophistication. You can't get a complete picture of modern Croatia without a visit here — away from the touristy resorts, in the lively and livable city that is home to one out of every six Croatians. Get to know Croatia’s capital through the included city tour. The city is packed with historic buildings, such as the neo-gothic St. Marcus Church. Your tour with local guide will also include cheese tasting at the Dolac Market as an ideal place to delve into Croatia’s culinary scene and funicular ride to the Upper Town. Enjoy a free afternoon in the town or back at your hotel. From Croatian capital we head north to one of the greenest and most charming capitals of Europe. Ljubljana – capital of Slovenia. Enjoy a walking city tour of Ljubljana and see some of the most significant sights of the old city centre such as the picturesque Central open-air market and the Three Bridges, both designed by famous architect Jože Plečnik, as well as the Baroque Town Hall and Robba's Fountain. During your tour, you will also visit the Ljubljana Castle and Virtual Museum. Travel with your guide out of the city to the Lake Bled, whose emerald green waters set against the backdrop of looming alpine peaks combine to create an idyllic natural setting. Visit the lakeside castle and enjoy breath-taking views of the mountains, lake and surrounding countryside. Afterwards, optional boat ride on the lake Bled: board an old-fashioned hand propelled gondola known as "pletna" for a private cruise across the lake to the small island in its centre. Here you will find the Church of the Assumption whose 15th century bell should be rung to bring good luck! Proceed to the beautiful Bohinj region, which is divided into the Upper and Lower Bohinj Valley. At the heart of the Julian Alps, in the Triglav National Park, you are greeted by Bohinj, one of the prettiest Alpine valleys. There are twenty-four typical Alpine villages in two valleys. In the Upper Valley by the lake, visit the gothic St. John the Baptist Church, which has well-preserved frescoes from the 15th and 16th century. The journey continues with a cable car ride to the mountain Vogel (1,537 m/ 5,000 ft), from where there is a wonderful view of the Lake Bohinj and the Julian Alps. In the afternoon, we will join locals at a Dairy Farm during butter & cheese production made in a traditional way – in a copper kettle above wood fireplace. Today we head to the “Opatija Riviera” – the former Habsburg vacation resort – and modern-day resort town – nestled between green forested hills and the cobalt Adriatic. On our way, we will stop at the Postojna Cave – the best-known karst cave in the world. It is also the greatest tourist attraction in Slovenia and one of the world's largest karst monuments. It is the only cave in the world operating a cave train, so visitors can admire the immensity and the powerful allure of the underground world, where the geological past is revealed to visitors in its own way while riding a train. In the late afternoon arrival to Opatija and overnight in hotel. A full day tour starts in the morning. Driving along the coast to Pula ̶ the largest city in Istria. Upon arrival, guided city tour starting from the amphitheatre Arena, stopping by the Hercules Gate, the Cathedral and finishing at the Temple of Augustus. Continue to village of Bale for olive oil tasting with snack. The tour then continues by travelling to Rovinj. Upon arrival, a stroll through the town to the Church of St. Euphemia and artist colony to the city gates. After the tour, lunch time at leisure to explore several nice restaurants in the centre. Late afternoon return to Opatija. Today we discover one of Croatia’s most astounding natural sites: the cascading lakes of the UNESCO World Heritage-listed Plitvice National Park. Walking trails hug the lakes, allowing us to journey on foot and watch as the water transforms from emerald green to azure blue. Late afternoon departure for Split, arriving early this evening in time for dinner. Departure transfer to the airport or port.